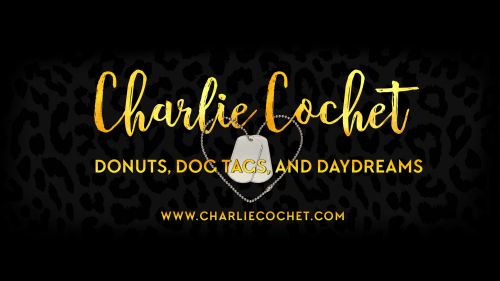 Blogger Girls - GRL Post, Schedule, Swag, and Giveaways! Hello all! I'm super excited to be over at the Blogger Girls today with my post for the GRL Blog Tour countdown. Check out where to find me with my GRL schedule, the special giveaway I'll be having for those attending, and the rafflecopter giveaway open to everyone! Hello all! Hope you had a wonderful weekend! This week's update brings some exciting news. As some of you may know, the THIRDS series is currently being translated into French, with Contre vents et marées (THIRDS t. 1) being released June 30th. I'm super happy to announce that The Auspicious Troubles of Love series is also currently being translated into French with Les Mésaventures Prometteuses de Chance (The Auspicious Troubles of Chance) coming soon! There's also talk of the THIRDS being translated into another language as well, but I'll share more on that as soon I have more solid info. Along with translations, the North Pole City Tales series has been contracted for audiobook! The Heart of Frost and Vixen's Valor will be released on audio late this fall! Mending Noel is already available, and if all goes according to schedule, Loving Blitz should be out in eBook format in December. I've had a few folks ask if Against the Grain will be released on audio. I do believe it will be, but I won't know for sure until the eBook is released. DSP contracts audiobook on or after book release. With the THIRDS I usually hear from them about audiobooks a few days after release. I'll definitely share more on that once I have more information. The Against the Grain Blog Tour starts Aug 3rd and there will be an awesome giveaway that includes swag themed to the book. Expect some fun geeky stuff. On July 20th the fabulous Joyfully Jay is hosting the exclusive cover reveal for my contemporary romantic comedy novella Beware of Geeks Bearing Gifts. The pre-order will also be available on July 20th, and along with the cover reveal there will be a giveaway and exclusive excerpt. Release day is Aug 19th. There will also be a blog tour starting Aug 19th. More info on that soon. I'll also be attending GRL in San Diego, CA in October 2015 as a Featured Author, and Coastal Magic Convention in Daytona Beach, FL in Feb 2016 as a Featured Author, so stay tuned for info on panels and events as we get closer. I'll also be attending RT Booklovers Convention in Las Vegas 2016. More on that soon! I think that's it for this week. Stay tuned to the blog for more on upcoming releases, up dates, events, and more! 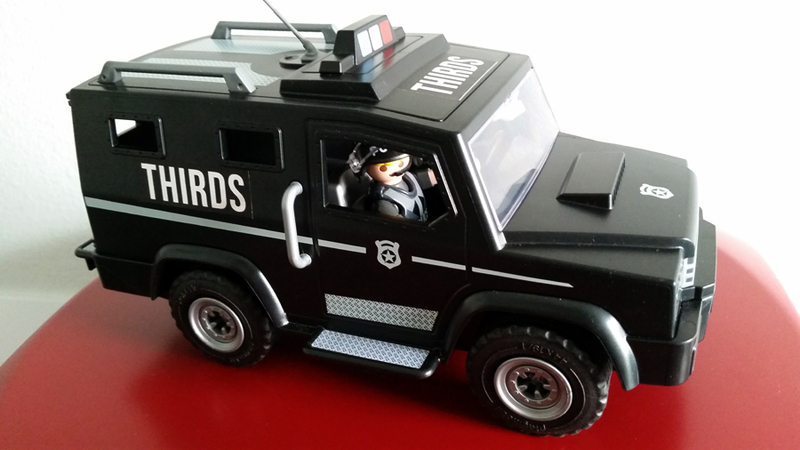 Gearing up for GRL, Swag, and More! Hello all! I am just flabbergasted by how quickly the time has gone. Two weeks from today until GRL officially kicks off. Where did the time ago? So much to do, to prepare. I'm still boxing up swag. Then there's packing, deciding what shoes to leave behind. I'm so looking forward to seeing everyone and meeting new folks. For those attending, this year the fabulous Guidebook app is back. 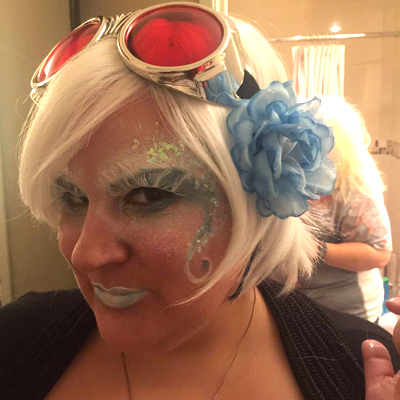 You'll be able to find my name under the list of Registered Authors in the GRL 2015 Guide and it will list all my sessions and events in case you'd like to add them to your schedule. These are my events along with a few others I plan to attend. There a few more, but I likely won't know where else I'll be until closer to the event. Thursday Oct 15th: 3.50 pm to 4.45 pm – Featured Author Spotlight (Author Q&A) Charlie Cochet, Rhys Ford, and Lisa Henry (Mission Ballroom A). Thursday Oct 15th: 6.30 pm to 8.30 pm – Dine-With-An-Author Opening Night Event (Bahia Beach & Patio). For those who are interested in sitting at the table I've been assigned, there should be a number on every registered authors' name badge to let folks know which table we'll be seated at. Friday Oct 16th: 12.35 pm to 1.20 pm – Author Lounge (A Session) (Mission Ballroom D & E). Saturday Oct 17th: 12.30 pm to 3 pm – Featured Author Booksigning Event (Del Mar Room). I'll have lots of nifty THIRDS swag, different items in different places. So what swag is going to be where? THIRDS Dex & Sloane jaguar bookmarks (not pictured above). 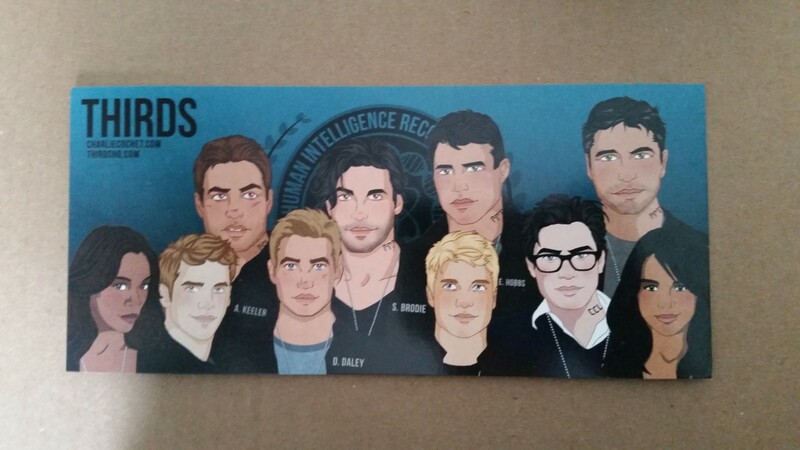 And these rack cards with the whole team! Both sets of character collector cards (pictured in first image. Quantities are limited). Charm bracelets (there are actually more than the ones pictures above). We have one for each of the guys: Dex, Sloane, Ash, Cael, Calvin, Ethan, Seb, and Hudson. These are very limited. Roughly 50 of each so we'll have to keep it to one per reader. I know it'll be tough to choose. THIRDS Dex & Sloane jaguar bookmarks (they look like the banner below). 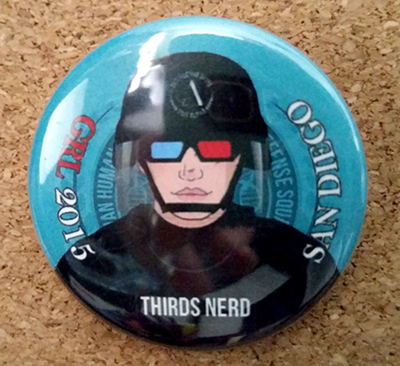 THIRDS Nerds GRL 2015 San Diego buttons. I'm not sure where he'll be yet. If the banner and all its pieces make it okay to San Diego, I'll be finding a spot for him after I arrive. Not attending GRL? Win some GRL swag! Hello all! Since there are folks who won't be able to make it to this year's GRL, I thought I'd have a giveaway for those not able to attend. I'm giving away 2x Destructive Delta Tote bags with GRL swag goodies. The giveaway is open Internationally and ends Tuesday Oct 20th at 00:00 Eastern US time. To enter just leave a comment below. Winners will be chosen at random and notified via email. GRL Post & Giveaway Winners! Hello all! I’m finally getting back into the swing of things after returning from my trip to San Diego. It always takes a few days to catch up, sort through all the emails, and compile the massive To-Do list before I start working my way through it. I couldn't hope to chronicle everything I did during that amazing week or this post would be ginormous. I had an amazing time at GRL in San Diego. It was so great to see old friends and meet new ones. There were folks I chat to online who were able to make it for the first time, so I got to put more faces to names and give them hugs. One of my lovely readers cosplayed as Dex from the THIRDS and I was just completely in awe. I never thought I’d see the day someone would dress up as one of my characters. I was just blown away, and I was gifted Dex’s name badge which was just the ultimate awesomeness. Getting to meet my readers was just the most wonderful experience. It always is. I was touched by everyone's love for these books. Regina—our cosplaying THIRDS Nerd—gifted me a 5lb bag of gummy bears which I munched during my signing and the rest I shared with folks--because we all know I would have eaten them otherwise. Mmm, gummy bears. 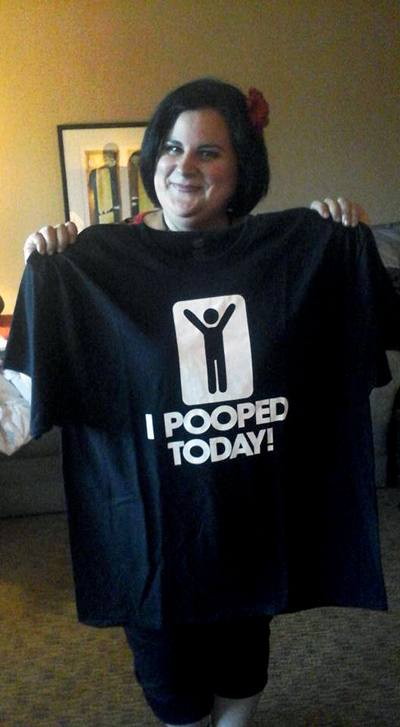 I was also gifted this fabulous T-shirt by Cathy and Lindsey, which had me laughing often. Dex wants to steal it to bug Sloane with it but he can't have it. Dex made it to the con in one piece and he was loving the attention. Ash will never hear the end of it. Thank you so much to the lovely ladies who volunteered to have me ship swag and poles to them and then carted all my swag to the hotel. I got to take a picture with the adorable Skip & Pip, and just swooned over my Dex & Sloane pony buttons made by the amazing Catherine Dair who I got to hang out with. 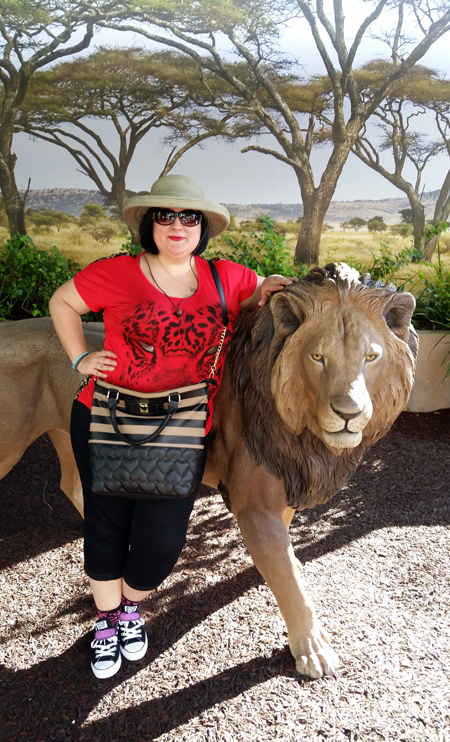 On Wednesday I went to San Diego and had a fabulous time with an amazing group of folks. I saw this fella soon as we walked in and knew I had to have a picture, especially since I’d dubbed him Ash. We got to ride a purple bus around the park which was so much fun. I felt like a kid drinking my lemonade ICEE—which was so good in the heat—and taking pictures with the gang in the photo op spots. We ate at the tastiest Mexican food restaurant after a trip to the Hotel del Coronado. On Thursday the events began. 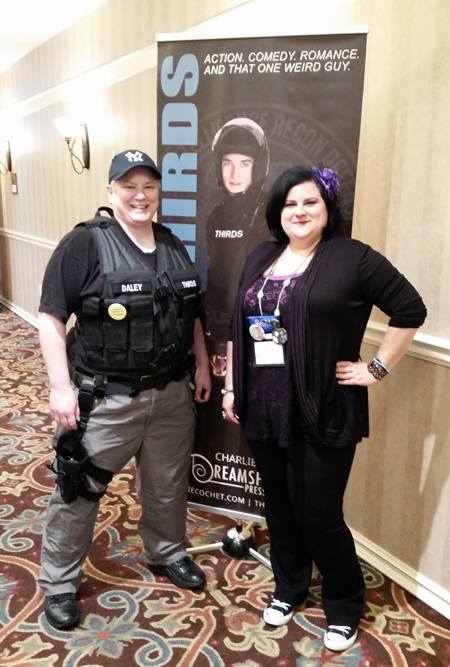 I was a little nervous about my Q&A with awesome authors Rhys Ford and Lisa Henry. 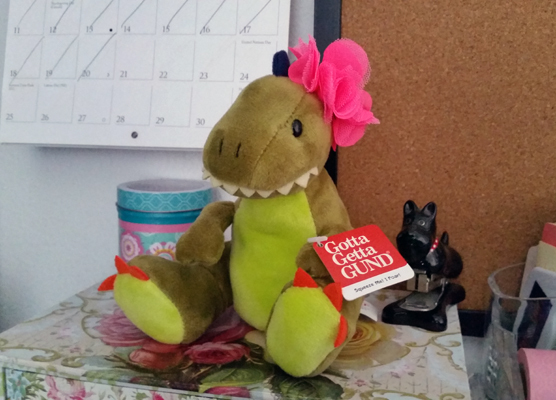 But when I sat down behind the mic, Rhys presented me with my little T-Rex friend, complete with flower and dinosaur sound effects—because Rhys is just amazing and I love her to bits—and I was just so happy and moved. The Q&A was fantastic. Not only did I have a great time chatting to folks about my books, but I got to listen to Rhys and Lisa talk about their stories, characters, and writing process. On Friday I had some mouthwatering Korean Food with a fantastic group of folks over at the Zion Market before heading to Big Joy Family Inc where I was introduced to Vietnamese coffee A.K.A Nectar of the Gods. I got to hear Greg Tremblay read from some fabulous books by Rhys Ford, Mary Calmes, and Jamie Samms. I often get asked what my favorite part of GRL is, and I have to say it’s the people. As a full time writer, this is my career, but who says I can’t have fun while working? After all, I’m very lucky that I get to do what I love. Just meeting and hanging out with all these folks who love our genre is a gift. This is a place where you can be surrounded by like-minded people who have come together to celebrate this incredible genre, and I hope to never lose sight of that. A big thank you to Barb and Mary Taylor who were always ready for a Starbucks run, always there to lend a helping hand, and are just the sweetest people. To my awesome roomie Kim Fielding, it's always a pleasure. To all the THIRDS Nerds and readers who came to see me, who said hello, asked for a hug or a photo, who chatted, brought cookies, laughed with me about Dex’s antics, who offered their support, or a shy smile, I thank you. I couldn’t have asked for a more amazing group. I am in awe of the love and support you’ve given me and my books. To all my fellow authors and friends—too many to list here, but you know who you are—who have inspired me, supported me, offered me comfort and kindness, who’ve made me laugh, smile, and provided a steady stream of amazing hugs. To Poppy and Amy, my mama bears whose smiles alone brighten my day. I never feel lost when you're around. A thank you to my awesome publisher Dreamspinner who’s helped put me on this path. To everyone who hung out with me, who shared a little piece of their hearts with me. A huge thank you to everyone who entered the GRL giveaway for those who were unable to attend. I have two GRL Swag bags, plus four tote bags with character cards as runner up prizes. I’ll be emailing everyone by the end of the weekend to arrange delivery of your goodies. Tote bag + character cards: Katelyn S.
If you didn’t win, have no fear, there will be plenty more giveaways coming soon. Thank you!